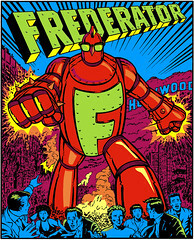 The Frederator Studios Blog: A Free Frederator Silkscreen. Want a free skilkscreen overstock print? Just write to alex@frederator.kz. 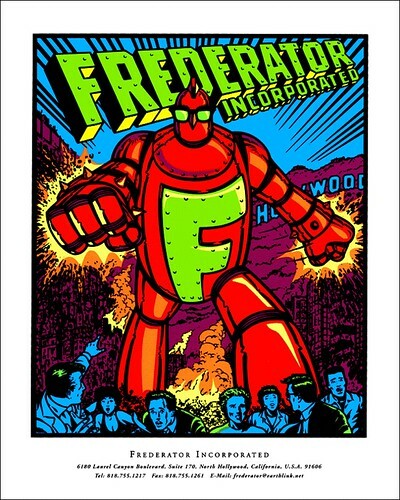 In January 1997, my assistant Stephanie and I launched Frederator in a giant conference room in LA's car parts capitol, North Hollywood. Our friend, the great artist Arlen Schumer (of the Dynamic Duo Studios) volunteered to interpret our namesake (I told him it was Gigantor, though it was really a pet name from my wife). My long term obsession with Frank Kozik's brilliant reinvention of the modern rock poster led our other friend, artist Patrick Raske, to come up with a silkscreen color scheme, which we then had hand printed in Michigan. We sent out a numbered edition of a few hundred, and the overprinting went into storage. So, here's your chance for the only officially sanction, bona fide, hand screened, Frederator collectible. Just drop an email to alex@frederator.kz, and as long as supplies last, we'll send one out right away. That poster rocks man... it carries on in that Frederator tradition of rockin'. Stay well and true to the rock Fred! Thanks for the kind words Dan. I'm frightened that we've been around long enough to have a tradition.